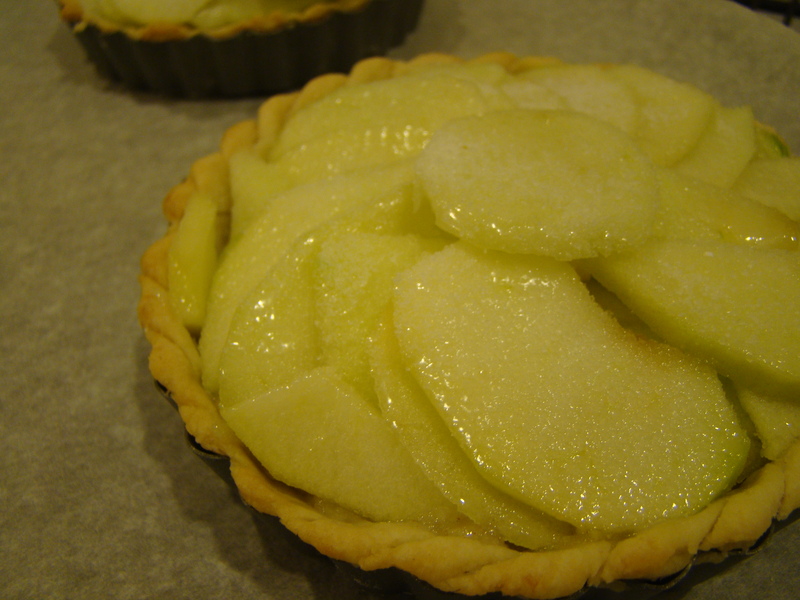 This week’s recipe for Tuesdays with Dorie was a patisserie-worthy French Apple Tart. Tarts are my favorite kind of dessert. I’m not clear on the difference between a tart and a pie, but somehow when something is baked in a tart pan with its fluted edges and served freestanding on a pretty plate, it tastes that much better to me. Come to think of it, I’ve baked most pie fillings in tart shells for years and couldn’t say the last time I actually made a pie. This tart has a number of components, so it takes a while to make from official start to end. However, with advanced planning, it would be much quicker. Once again, I found myself without an occasion to share and no need to eat an entire tart singlehandedly. All I can say is thank heavens for miniature baking dishes. Rather than make one 9-inch tart, I halved the recipe and made two 4-inch tarts with some leftover un-tarted ingredients. As with any tart, you start with the flaky pastry crust. I didn’t use the book’s recipe for this one, preferring my favorite all-butter crust from Mark Bittman to one that contains shortening. Next, you make an apple compote which is like a thick oven-roasted applesauce. Tart Granny Smith apples are roasted with sugar, cinnamon, flour, bread crumbs, and a bit of lemon until they are soft enough to mash up. The compote is used to fill the partially-baked tart shells. Finally, the filled shells are topped with a circle of thinly sliced apples brushed with melted butter and sprinkled with sugar. 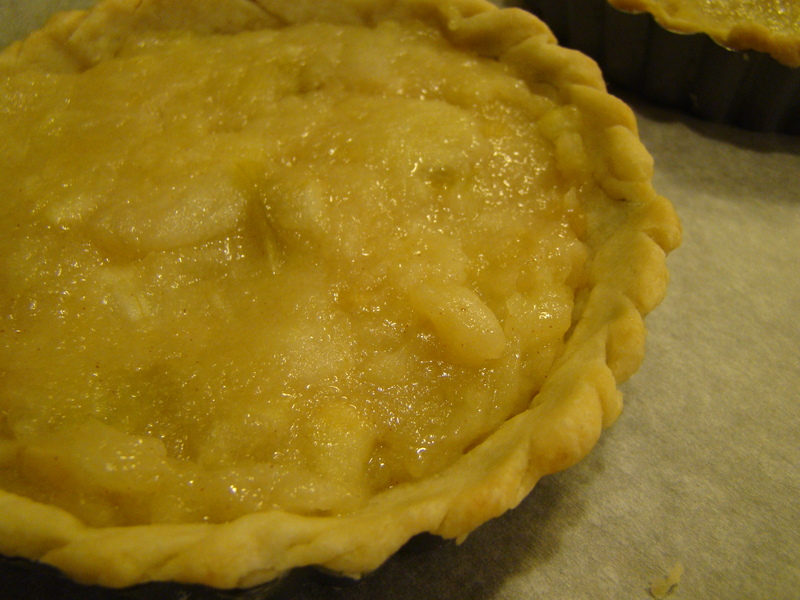 The tart is baked until the apples are tender and start to burn on the edges. I was surprised that step took the full baking time for a whole tart even for my mini-tart. The tarts looked very professional. I impressed myself. The contrast of the tender apple slices and the compote was delicious. If you didn’t know what was inside and were expecting all apple slices, it would be a pleasant apple-y surprise. 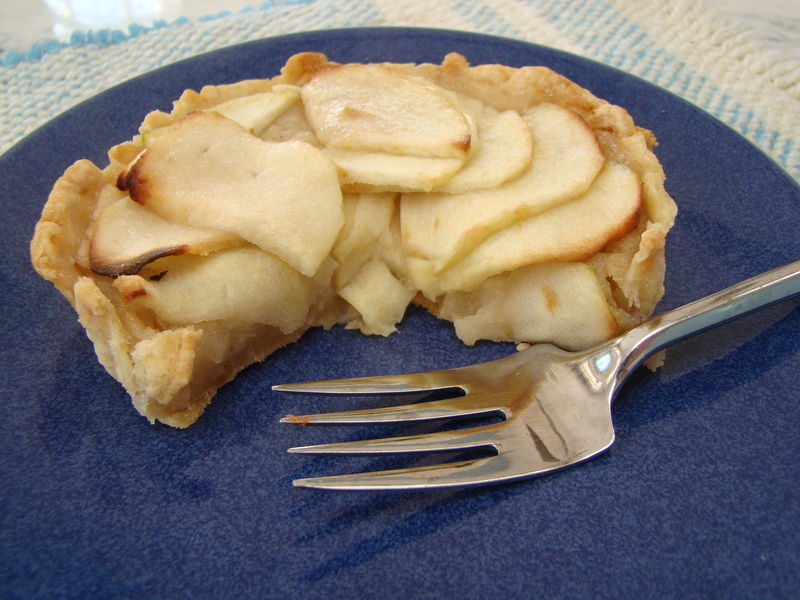 French Apple Tart will definitely go on the list of desserts to make again. Next time, I hope my apples end up a little browner. For the recipe, visit this week’s host Gaye (a fellow Dorista) at Laws of the Kitchen. The recipe can also be found in Dorie Greenspan’s book, written with Julia Child, Baking with Julia. To read about other bakers’ tarts. follow their links from the LYL link for this recipe on the Tuesdays with Dorie site.